It's probably due to my Celtic background, the Irish ancestors or something, but I love oats. Oats were once a staple grain for much of Northern Europe, especially England, Scotland and Ireland. They have a nice, nutty taste and lots of water soluble fibre. When I was growing up, my Mom would often make a whole pot of oatmeal for breakfast during the colder part of the year. If made ahead and kept hot, oatmeal has a tendency to become gummy or gluey. Fraid that was the case with Mom's oatmeal if my memory serves. Still, many mornings a week these days I eat oatmeal for breakfast and I love it! I add some golden raisins and pour a little milk on top once the cooked oatmeal cools a bit. When I make quick breads or muffins, I often whirl some rolled oats around in the food processor to get some ready made oat flour to add to those goodies, just because I like the way they taste when I do. I know that oats are a healthy food, too, especially if you don't add quantities of butter, brown sugar, and cream. Another Irish staple, potatoes, also is pretty healthy until you start adding in the butter, sour cream and salt in large doses...but that's for another post. Continuing on my bread baking journey, this week I decided to see what happened if I used some of the things I had learned making loaves in the past and applied that learning to making my own bread recipe. An oatmeal bread seemed like a good place to start. First I made some oatmeal using steel cut oats. Once the oatmeal was cooled, it went into a poolish, along with whole wheat flour, all purpose flour and some rolled oats...the kind that are quick oats because you can cook them in the microwave in a little over a minute. Some sourdough starter also went into the mix, along with water and salt. The next morning the third kind of oats came into play. The poolish went into the mixer bowl and was joined by old fashioned rolled oats...the kind you cook for at least five minutes, but usually longer...plus some more whole wheat flour, some bread flour, some buttermilk and honey and egg. This made a wonderful, elastic, easy to work with dough. 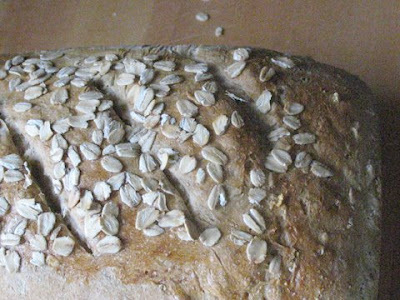 Once the loaf had been shaped in a loaf pan and had risen, it received an egg wash and a sprinkle of some more of the old fashioned kind of rolled oats on top. A few slashes across the top and into the oven it went. This bread browned up slowly...even when slices went into the toaster. 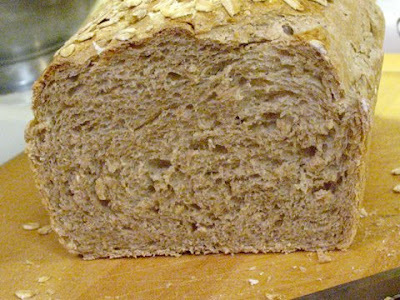 It has a nice rough texture from the old fashioned oats and makes great sandwich bread. 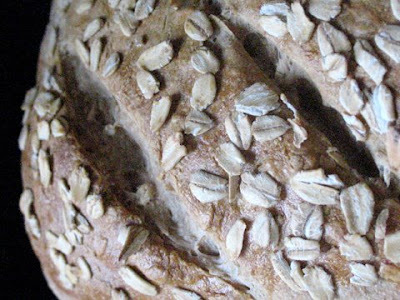 If you like oats, you will love this bread. No sourdough starter? No problem. Just put a teaspoon of dried yeast into 1/3 cup of warm water (not above 110 degrees F) and let it sit 10 minutes to proof. Then add it to the poolish instead of the starter. This bread makes a great entry into Susan of Wild Yeast's Yeast Spotting event. Whisk all the ingredients for the Poolish together. Cover with plastic wrap and let sit in cool place overnight, or for at least eight hours. In a heatproof measuring cup or bowl, mix together the buttermilk and honey. Warm slightly in the microwave. Cool if needed so that it is no hotter than 110 degrees F. Mix in the egg. Take all of the Poolish and put into a stand mixer bowl. Using paddle attachment, mix in the buttermilk mixture, the rolled oats, and 1 cup of the bread flour. Remove the paddle and using the dough hook, incorporate the remaining bread flour and the whole wheat flour. If needed, use more bread flour, a tablespoon at a time, to make a dough that cleans the side of the mixer bowl. Knead with the mixer and/or by hand for 8 - 10 minutes until dough is elastic and somewhat smooth. Place dough in oiled bowl; turn dough to oil other side. Cover with plastic wrap and let rise until doubled in bulk, about 2 hours. Punch dough down and turn out onto a floured board. Knead lightly a few times to release trapped air. Divide dough in half. Shape each half into a loaf shape and put into a loaf pan. Cover and let rise until almost to the top of the pans, about 1 1/2 to 2 hours. Preheat oven to 350 degrees F. about 15 minutes before bread is ready to bake. Brush egg wash over the top of each loaf and sprinkle liberally with the rolled oats. Cut slashes in the top of the loaf and bake in preheated oven for about an hour, until top of bread is golden and loaf sounds hollow when bottom is tapped. Cool on a wire rack for at least 45 minutes before slicing. Makes 2 loaves. I recently made a loaf of white bread and substituted 1/2 c rolled oats for flour - it just disappeared ( I thought traces would remain) and the bread was super moist. I'm telling you. You are in serious contention now to be a certified yeastie! I love that bread and I've been sneaking oatmeal in my breads too lately, mostly because I'm eating steel cut oatmeal three times a week right now and it always makes too much. I love oatmeal, and I love this! What a great bread. I'm a big fan of oats too. This looks like a good one. 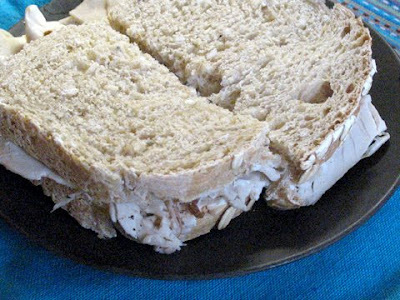 I make an oatmeal bread often for our sandwiches. I will have to give this one a try. 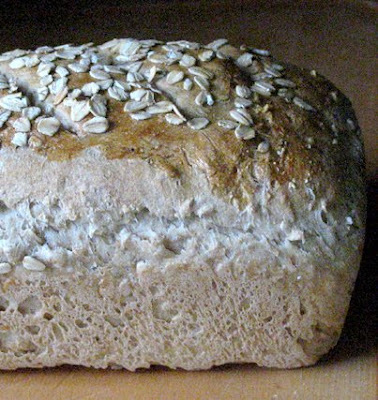 I love the look of this bread, and the three oats that are in it. I've been putting oat flour in just about everything lately, but this is much better! This sounds gorgeous. I looks like it makes a wonderful loaf. Oats always make bread nice and moist. Soup - Looks the Same..but What a Difference!